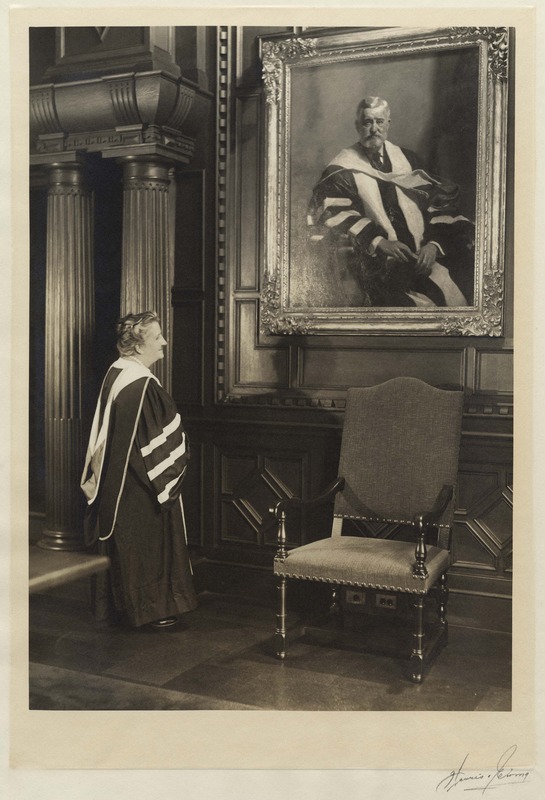 Emily Jordan Folger wearing her purple Amherst hood in the reading room of the Folger Shakespeare Library in 1932. She gazes at the Frank O. Salisbury portrait of her husband, Henry Clay Folger, in the same hood. Another awardee at the ceremony was ex-President William Howard Taft, who received an honorary Doctor of Laws Degree. Who was observing the two eminent gentlemen enter the motor vehicle headed for a banquet following the exercises? Folger was five feet four and weighed 115 lbs. Taft was six feet tall and weighed 335 lbs. Inside, Dr. Taft leaned over and said mischievously to Dr. Folger, “Forty-nine Folios? We have the fiftieth at Yale.” Founder of the University’s Elizabethan Club, Yale alumnus Alexander S. Cochran donated to the Club a Shakespeare First Folio in 1911. In picking Folger for an honorary degree, Amherst got it right. Folger had climbed to the top of two vastly different fields: the petroleum industry and Shakespeare collection. To have accomplished either one would have been a prodigious undertaking. By 1914, Folger was president of Standard Oil Company of New York, which later became Mobil Corporation. His Shakespeare collection then included forty-nine First Folios, all different in some way. Before he died in 1930, Folger had acquired eighty-two copies of the Bard’s 1623 collected dramatic works published posthumously in London. Folger wrote Amherst trustee, Talcott Williams, “I wish to thank you from the bottom of my heart for this the greatest honor of my life.” He wrote his pastor, S. Parkes Cadman, “It was most unexpected, but the greatest possible honor. Amherst gives few degrees. You will be amused at the basis for conferring it; it was not all Shakespeare.” From Pocantico Hills, New York, came this tongue-in-cheek accolade: “I congratulate you upon receiving the degree, and that your connection with a great and useful business organization did not detract from your high standing,” signed John D. Rockefeller. 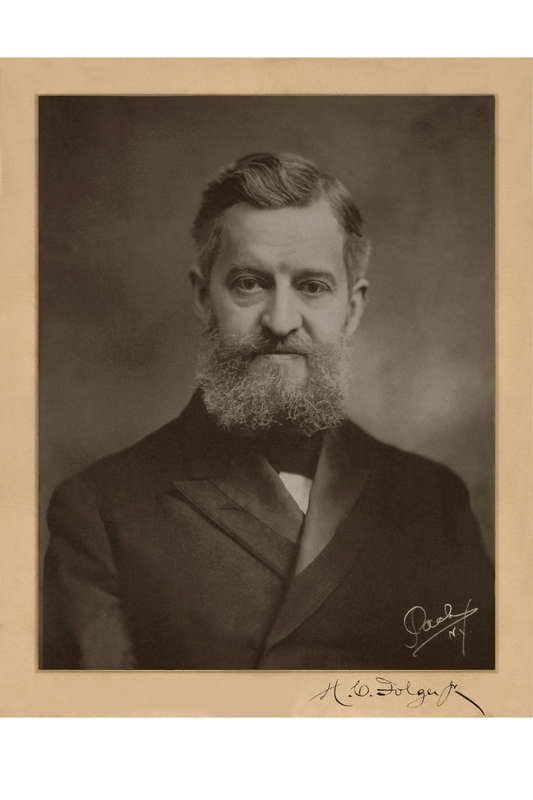 Henry Clay Folger died in 1930 without having seen a stone of the Folger Shakespeare Library built or his entire collection assembled in the nation’s capital across the street from the Library of Congress. His wife, Emily, took over the decision making responsibilities and was present to turn over the keys of the Library to the chairman of the Amherst trustees on Shakespeare’s 368th birthday, April 23, 1932. Later that year, Amherst College bestowed on Emily a degree with this citation: “Emily Clara Jordan, graduate of Vassar College, through many years the enthusiastic, tireless, and discriminating companion of Henry Clay Folger in the collection of a unique library of the works of Shakespeare; generous benefactress of Amherst College and of the lovers of letters throughout the whole world; the degree which 18 years ago Amherst College appropriately bestowed upon your husband it now, with the same hood as symbol, confers upon you, as I create you a Doctor of Letters.” It was a triumphant yet bittersweet moment for Emily Jordan Folger. Meet Steve Grant on October 23 at the Oliver Wolcott Library in Litchfield, CT; on November 8 at the National Press in Washington, DC; and on December 1 at the Central Library in Arlington, VA. For more information, visit Steve’s website.